I'll be doing plenty of cons and signings in Austin and San Antonio to promote them starting next month, so more on that soon. And let's just say that Titan is going to be watching how these sell, so... if you want to see more official Who work from me (and Simon! ), pick 'em up, huh? I'm waiting for an Anime cover. conngradulations i love titians comcis im am really looking forward to the cyberman team up. This cover art is amazing! Do you also do cover art for the 12th Doctor's stories? ~That~ is a 'squee' moment!! I wish I knew about this in advance. Love these covers. Would have loved to get them instead of the ones I did get (not calling the other artists bad). These are just awesome. Well done mate! Love Capaldi hiding in the TARDIS doorway. You really deserves it, you're a great artist!!! I am hoping to become an artist for comics like Doctor Who myself as well like you one day! Hmmm... I'm not sure what you're referring to? These are covers for a pair of limited run comics that both price around $15 each (less if they're pre-ordered). I don't know of any large poster planned for this. I think an 11x17 lithograph was discussed (not sure where that's at- it's all official stuff that's over my head)- but I strongly doubt it'll be in that price range if it happens. I could be wrong- but I don't know of anything carrying the price point you're talking about. If you have more info, I'd like to know. Is it possible to get a version of this without the titles? I would like to use it as my desktop, if that's okay. I guess you could say, "It begins..."
Wonderful work, I love how you stuck our "Mysterious New Boy" in the doorway of the TARDIS. What a way to start your work for Titan Comics! Blockbuster cover! -Also, the www.heroesandfantasies.com store is very obliging. I called the store and they put me on their email list for updates on signed issues of these, prints, etc. Congratulations! What an awesome montage! Thank you, thank you very much, this is your best drawing to date. Together all my Doctors. I would like you to do another similar drawing but with companions, including Big Finish and novels companions. I actually have an "every companion ever" commission pending- I just need to find the time to do it b/c it'll be such a massive undertaking- probably an even bigger task than my "Infinite Doctor" piece. 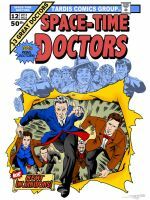 It goes without saying that I'd get as many "spinoff media" companions in as I reasonably could, but I'm not sure if I'd include all of them- the 8th Doctor alone must have about 20+ between TV, audio, novels, comics and comic strips. So major ones like Lucie Miller, Fitz, Izzy, C'Rizz, etc would be in, but I'm less sure I'd have room for shorter-lived companions liked Mary Shelly or Tamsin. And then there's stuff like the Tenth Doctor's companions from novels and the Doctor Who Adventures strip, etc- that's stuff I'd probably skip over. There's already two more companions on the way in the 10th and 11th Doctor comics from Titan, and Big Finish is always adding new companions to the past: Oliver Harper; Flip; Thomas Brewster, etc- so it's impossible to make one thatr'll stand as "complete" for more than a year anyway. But I'll certainly try to cover all the fan favorites like Evelyn Smythe, Kroton, Frobisher, etc. Hey, Congrats on the official approval! Superb! So happy for you. That's great. Congratulations on the gig! I particularly like the stealth Capaldi. Beautiful! I have got to get one of these. HOLY CRAP I AM SO HAPPY FOR YOU. So well deserved! Thanks! I've been chasing this one a long time. I feel like Indiana Jones when he finally recovered the Cross of Coronado. I hope you had some really uber special-occasion liquor to break out for it, too. Thanks! It actually "almost" happened a little earlier- last year IDW was finally considering me for some cover work, but then they lost the license. It worked out in the end though, b/c I get to be part of this one right at the beginning. Congratulations, this is fantastic news. Congratulations!! Well deserved and WOW this looks great!! !